I started this post on January 31. Yikes! Talk about tardy. So by now, I’ve already worn most of the pieces and you’ll probably be able to tell what I got and what I didn’t get. Still, I think it’s important to give credit where credit is due and wanted to give Stitch Fix a mini shout out after some flack that I’d been giving them for my last couple fixes. I’ll admit, I went into this fix with a bad attitude. After Fix 2 and Fix 3 I said to myself, I’m going to give this thing ONE. MORE. CHANCE. and it BETTER not let me down again. And, to be honest, I had to take a second look at some of these items before I gave them the ultimate thumbs up. 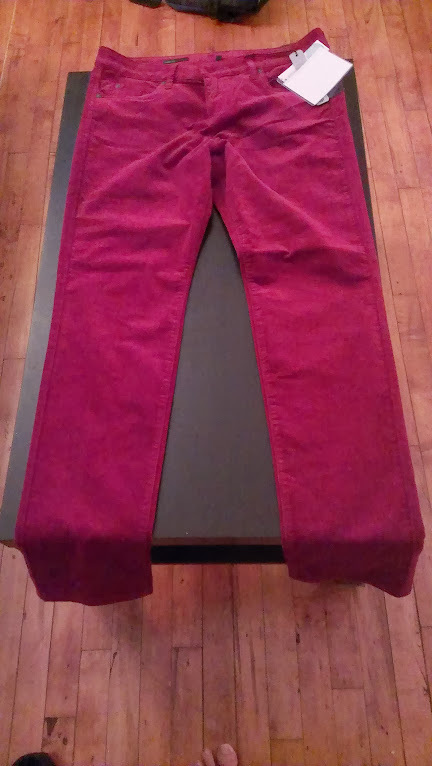 Throughout the whole experience I just had to repeat my Stitch Fix manta: remember the red pants. If you’re just tuning in, you may not know that a few months ago I started subscribing to Stitch Fix , an online personal styling service for women. The gist is, tell them about your style, size, budget preferences, and needs and they send you a box of five items that have been “personally selected” for you. You can either schedule shipments (or “fixes”) one-by-one or sign up for monthly ones to keep your style fresh. Over the holidays, I received my third fix (you can see my past reviews here, and here). I won’t beat around the bush–this time around, I wasn’t that impressed. Rollin’ right along with blogs this week. Making up for lost time. Thanks to my workplace, in addition to getting Thanksgiving off, we got Friday off as well! When I found out that my Stitch Fix would likely get here on the same day I was ecstatic! For once, I wouldn’t have to make the hurried drive over to FedEx (or UPS, or USPS) to pick up a package that I couldn’t sign for during the day. Unfortunately, luck was not on my side with this fix. Even though I dedicated an entire blog post to personal style I must confess that I, for the most part, hate shopping. Crowds, tiny fitting rooms,and the humiliation of those full-length mirrors that are always lit with unflattering fluorescent light is enough to make me don my thread-bare, too-big, out-of-style garb and just throw a trusty cardigan or scarf over the whole thing. For my inner fashionista, this situation was simply unacceptable. Enter Stitch Fix, an online personal styling service. You just go online, answer a few short questions about your style, size, and budget preferences, and they send you a package of 5 items to try for $20. If you hate everything you send it back. If you like stuff you pay for it (the $20 fee applies to the total) and get a 25% discount if you buy all 5 items. So this was my mindset as I opened my first Stitch Fix box in the safety of my boyfriend’s room. I looked at the pieces and could feel my heart beating. I’d only just recently lost enough weight to even be eligible for Stitch Fix size-wise so knew that if these pieces didn’t fit I’d be out of luck; just another ill-fitting costume and another reminder of how big I am. #Upandcoming #Quarterlifer is a blog by Elizabeth Fei -- that's me! In it, you will find my musings on society, art, culture, community and other random issues facing me as a 30(! )-something student and professional. Your quarter-life isn't always a crisis, the best parts are still up-and-coming!